What’s App has almost replaced the primary mode of communication between friends and family replacing messages and phone calls and has also become a primary way to share photos with your near and dear, with the number of conversations going on with many people at the same time. There are many times that we have deleted some messages or chat conversations which we would like to store accidentally and repent it later. But there is no need to worry as there is a way to resurrect sorry recover or bring back the deleted messages or threads in Whats App using this method. These steps are useful in recovering deleted messages in Andorid device and not for Windows or iPhone which will be updating soon. Search for msgstore-2014-month(07)-date(03).1.db.crypt. The date should be the day on which you might have deleted your chat conversations. Rename the date on the file name mentioned above to which you want all the messages which you have and which have been accidentally deleted to be restored to. Now you have to Rename the msgstore.db.crypt file by adding backup in front of it like this – backup-msgstore.db.crypt. Then save the file names after you have made the required changes to it. Now to back to your home page and tap on Settings -> Applications -> Manage Applications -> tap and open Whatsapp and scroll down to find the Clear Data option and tap on it. Go back to home screen and tap to open Whatsapp and you will get a pop up box asking for permission to restore your Backup, tap on the Restore button to restore all the data which was deleted earlier. 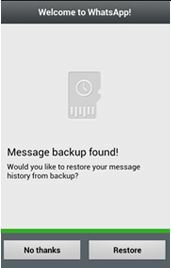 Now refresh the application or you can restart the application to see that your messages have been restored from your backup. That is it and now you do not have to worry if you have accidentally deleted any messages as you can easily restore those messages with the simple procedure which we have mentioned above.